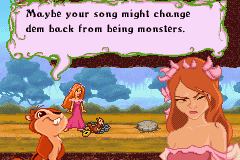 Enchanted: Once Upon Andalasia. . Wallpaper and background images in the encantada club tagged: enchanted walt disney pictures 2007 video game gba screenshot.